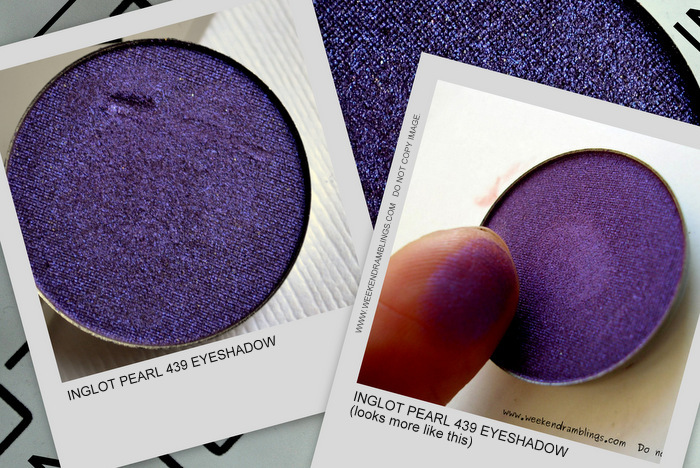 Inglot Eyeshadow Pearl 439: A shimmery, satin purple, Pearl 439 has a satin texture that is quite typical of shadows from Inglot's "Pearl" range. 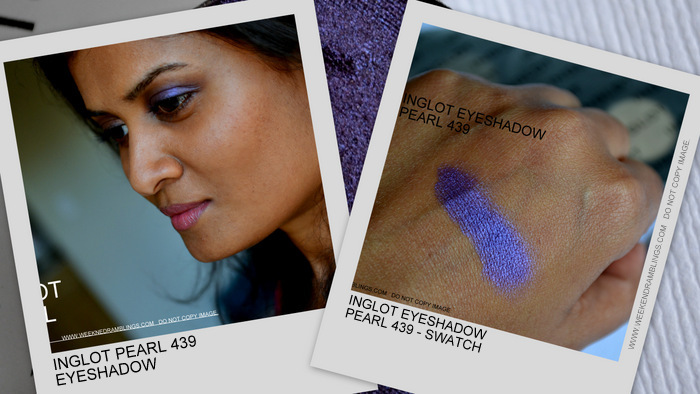 There is very fine bluish violet shimmer scattered throughout the shadow, and on skin swatches it has a pearlescent shine. I ordered this eyeshadow, going by online descriptions and swatches, as part of the Inglot Freedom System Palette. The color is a little more bright than what I would generally pick up on my own, and I haven't used it much either. Of late, though, I have figured the best way to use this is along the outer corners over other brown/plum shadows. The pigmentation on this eyeshadow is awesome, and there is no creasing, smudging with this. Scroll on for photos and swatches. Probably because of the not-so-great light, my camera just couldn't pick up the true color of this eyeshadow. Thankfully, I had an older photo to add for reference - the photo on the right shows the more accurate color. Probably because of the bluish shimmer present in this shadow, the color leans towards the bluish-purple in my photos. The actual color is a little more purple and less blue than what is in the photos. While this is not a shade I reach for that often, I would definitely recommend Inglot Pearl 439 if you are into brighter eye makeup. Because it is intensely pigmented, you would need only the tiniest bit of shadow, and the texture makes it very easy to blend. Do check Temptalia's post HERE for better photos on Inglot Pearl 439.
dont worry about the right eye.. the color is looking gorgeous on you..
Nice vibrant shade! It looks pretty on you! Ya..their stores are so difficult to find!